"BUILD A FUTURE IN WYANDOTTE". ONE LOT OF FIFTY VACANT PROPERTIES OWNED BY THE GREAT CITY OF WYANDOTTE. 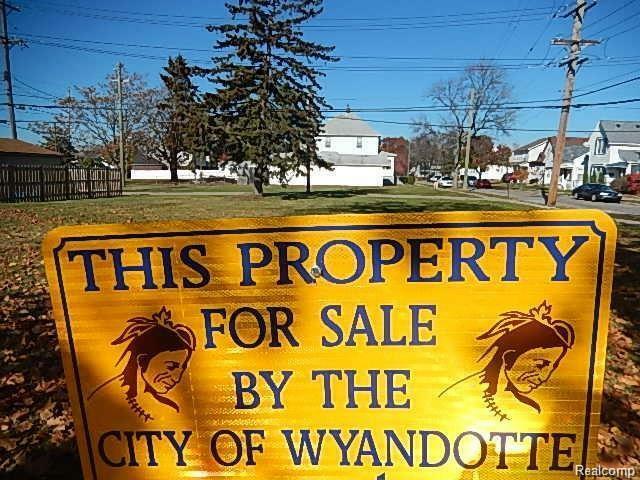 YOU MAY MAKE YOUR OFFER DIRECT WITH THE CITY OF WYANDOTTE TO PREPARE A PURCHASE AGREEMENT... BUYER MUST BUILD ON THE LOT WITHIN TWELVE (12) MONTHS. THIS OFFERING INCLUDES A DEFERRED PAYMENT PLAN. TERMS OF THE DEFERRED PAYMENT PLAN IS IF THE PROPERTY IS THEIR PRIMARY RESIDENCE, THE PAYMENT AND CLOSING COSTS ARE PLACED AS A LIEN ON THE PROPERTY FOR TEN (10) YEARS. IF THE BUYER CONTINUES TO OCCUPY THE PROPERTY AS THEIR PRIMARY RESIDENCE TEN (10) YEARS THE LIEN IS DISSOLVED AT THE START OF THE ELEVENTH (11) YEAR. IF BUYER MOVES EARLY, THE ENTIRE AMOUNT IS DUE TO THE CITY. CITY WILL REVIEW AND EVALUATE ALL OFFERS. IDX provided courtesy of Realcomp II Ltd., via Re/Max On The Boulevard and Realcomp, ©2019 Realcomp II Ltd. Shareholders.